I have been in Hamburg, Germany for the past five days. I enjoyed an amazing opportunity to visit one of the world’s most respected heart rhythm labs. Among other things, the main purpose was to learn a new way to ablate atrial fibrillation. It was an incredible learning experience, one for which I owe an enormous debt of gratitude to the kind and generous people of Dr Karl-Heinz Kuck’s EP lab. Though these people are famous, they treated me as a respected colleague. Details of all that I learned regarding this newly-approved ablation technique is a matter for future posts. Suffice it to say, I already feel like a better AF doctor. For now, may I highlight a few of the more striking differences between Europe and the States, as noted by a Kentuckian on his first trip across the Atlantic? First...The transportation system in Europe uses much smaller vehicles. Other than taxis and buses, I simply did not see any over-sized passenger vehicles. There were no mini-vans, SUVs, or trucks. The streets of Hamburg looked much like a Whole Foods parking lot. Second…The bikes! 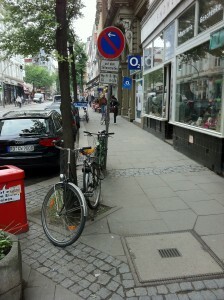 I was stunned by the sheer numbers of smart-looking people pedaling around on the sidewalks and streets of Hamburg. And these folks looked as though they were using bikes to get somewhere. For instance, more than a few business people dressed in suits and wingtips rode by on their three speeds. Amazing. Imagine that here. In five days, I only saw two guys in spandex that looked like they were riding just to get a workout. Third…People walk. Again, they weren’t power-walking with headphones and dumbbells, they were going somewhere. Fourth…Energy conservation: It wasn’t just the human-powered transportation or all the small cars; in the hotel, you had to insert the room key into a slot by the door to get power. When you left with the key, the lights were automatically powered down. Try figuring all that out at 0400. I quickly learned that all German citizens get free healthcare. But those who desire ‘more’ care can buy additional private coverage. I saw a hospital room for a private insurance patient: it was larger, had a single bed and a lake view. Private patients are also allowed to make special contracts with the doctor of their choice. Interestingly, those who I spoke with accepted this two-tiered system for what it was: two-tiered. It seemed obvious that you can get more (care) if you pay for it. Though all agreed that their government-supplied free healthcare was quite good. In fact, one of the attending doctors said that he was on the free plan, as were most, because the private plan was very expensive. Like the rest of what I saw in Europe, the Hamburg EP labs were also very different. Yes, each of the three labs boasted technological bells and whistles, like robots, 3D-mapping systems, and big beautiful flat screen monitors that were displayed–NASA-like–in spacious control rooms. But inside the operating suite was where the similarities with US labs stopped. The labs of Hamburg were quiet and under-stated. You could hear a pin drop. The procedure began with the patient quietly climbing to the table. The one (single, solitary, all by herself) nurse whispered something quietly in the patient’s ear, and the stoic patient complied with her wishes. Arms down, still, quiet, everything so quiet, always. Soon after the nurse administered sedatives, the patient fell asleep peacefully. The same nurse than draped the patient, opened the catheters and readied the mapping system. During the procedure, this same solitary nurse monitored the patient’s vital signs. There were no anesthesia machines, nor anesthesiologists. There wasn’t a circulating nurse click-clacking on a keyboard documenting all the ‘quality.’ They also got by without a certified radiation technologist to move the X-ray camera. One nurse, one doctor, and one patient. And my favorite part of their operation: there were no cell phones ringing, no pagers beeping and no radio blaring during the procedure. You could almost feel the focus. Oooh, sorry, that does sound a bit envious. How could they administer all this technology with so much less manpower? How can a German nurse safely administer propofol, but in America it isn’t safe without an anesthesiologist and sophisticated machines? How can they do such a complicated procedure without another nurse documenting everything on an EMR, and though I can’t be sure, I did not here anyone yell Time-Out. How can they think it’s okay that basic healthcare is free to all, but if one wants to buy more, there is more to buy? Doesn’t that imply that healthcare isn’t the same for all? There were some similarities…They cheered as loud as we do when tachycardia disappeared with a burn…or in some cases, a freeze. “It’s easy,” one of the talented Hamburg docs liked to say. Successful outcomes are communicated in a universal language. Germany spends $3,588 per capita, per year, or 10.4% of its GDP, on health care. The U.S. shells out $7,290 per person, 16% of economic output. This difference is not because we have more old people. One in five Germans is 65 or older, compared with one in eight in the U.S.